go on, invade my privacy. You’ve been sitting for the last few hours, or so. You’d go visit Alan in accounts but you really want to get this final TPS report done. You might get up if your bladder gets really insensitive, but you’ve broken through that barrier before. Did you even have lunch? Didn’t you have a meeting at 11am? You say you are in "the zone" but you are actually in a funk. And that twinge is back; when you slide down in your chair, your back begins to hurt. It hurts in an annoying way that reminds me of the way seagulls at the beach are annoying; you’re eating chips, so of course a seagull will come squawk at you, that’s what they do. It’s one of those things we come to expect in life. Wearing stripes makes﻿ you look fat. You sit down for too long, your back gets sore. Imagine now that you could avoid this pain forever, and the other annoyances of sitting – e.g. breast or colon cancer, bowel cancer and diabetes and heart disease who knows how many other ailments that keep worker’s comp lawyers in Audis. This is where I was when I decided to have a go at standing to work. My current role is in a large organisation a sports media company in a functional building with the requisite rows of desks, grey carpet, minimal noise. This predictability was a risk to my health and visual consistency is a downer in any creative environment. Furniture, music and wall art can help, but they’ll only take the edge off it. 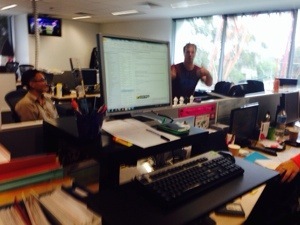 And in an open plan office, not everyone likes my selection of eighties dance hits and nineties grunge. I needed a game changer, something to feel more alive but also to help spur my mind, get my circulation going. 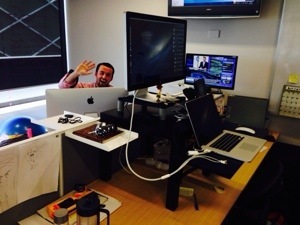 A meeting at YouTube in Google’s Sydney offices introduced me to a standing desk for the first time. Initially, I couldn’t even fathom it. 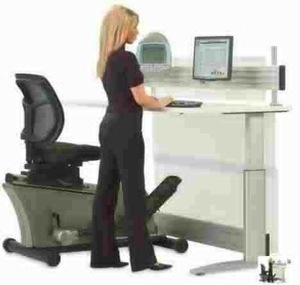 Was it a compact work station for temp staff who aren’t worth the floor space a chair demands? Capitalism is so crude, I thought. Google ain’t such a great employer, I thought. A bit of research lead me to find standing up has multiple health benefits, most of which make immediate sense. You move more, you walk around more. Your blood flow improves. Your heart rate increases. You sleep better. The collective result of this is more calories burned. But this didn’t interest me nearly as much as two other findings I made; your ergonomics improve and your mind is more alert. It’s bizarre to think our bodies were designed to sit for eight hours a day, (then two hours more on the couch at night laughing at celebs busting their guts on Dancing With The Stars). And this isn’t about furniture or ergonomics. Believe me, I have sat in some awesome chairs. I once visited Denmark where I dropped in on the Trapholt museum, a simple shrine dedicated to the Danish love of the seat. I love sitting. It’s a comfy, relaxing thing to do, I admit. But in every chair, regardless of its beauty, I can slump like an oaf on a couch. In the office, relaxing doesn’t seem to provoke action. It could even work against it. Sitting in an office, I know that as the hours wear on, my shoulders will curve forward and my spine will gradually compress until I am delaying any body movement at all, as I strain to keep my mind on the urgent tasks at hand. In this zone, I struggle to break the monotony. It has to stop – and it often did with a child-like sprint to the toilets that must have appeared as if I was the only person who had heard a fire alarm. Two weeks in and my body had become used to the new arrangement. Haven’t felt a (bad) thing since. It’s actually easier to stand in other places now, like on the train, at concerts, in queues. To be honest, I slept better from day one. Not longer, just better. I think I actually have more energy throughout the day and I now go to sleep a little later at night. That must be good for your core. My what? Oh yeah, great. Them: "WOAH…. What ARE you DOING!!??" Me: "I stand sty my desk now. You should try it." Them: "You aaaaare joking, right? That. Is. Ridiculous. You are insane." 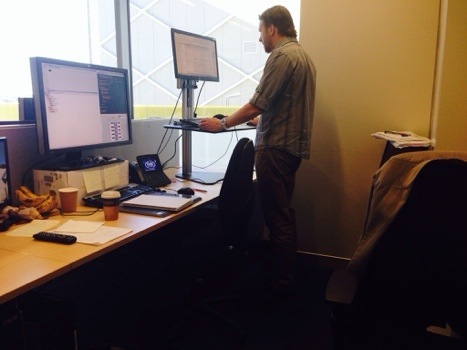 Standing desks are a thing and if you believe some reports, the number of office staff using them will explode in coming years. I’m sure some longitudinal stories will be needed before the benefits are confirmed, the deniers are silenced and we start seeing witty posters in the kitchen saying "Stand Up for Something" or "Sitting is for the weak!" 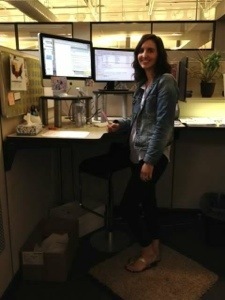 In a cool twist, my HR department noticed what I was doing, wanted to support the vision and had soon built me a desk tailored to my exact height. Two others in the company have since tried it with others planning to do the same. This is the WIRED-inspired IKEA version I use. It costs $25 plus a few screws, and as I have found, raising the monitor actually makes for a cleaner desk. 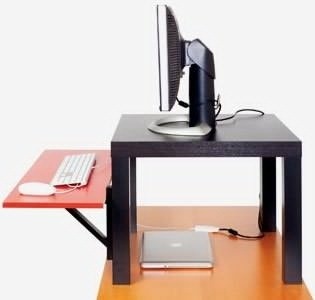 If you’re into this by now, check out some options: push-button up-desks, build your own electric desks, ugly hacks, the ‘ergotron‘, whiteboard desks and the hack I ended up using from IKEA. Sure there is. "All it takes is getting off your bum a few times every hour…" says Australian professor and ‘physical activity expert’ (Seriously, when I’m a professor, don’t make me sound like I inspect playgrounds), David Dunstan who says that you could simply disrupt your work flow every quarter hour or so with a strut around the office. Easy! You could also try an exercise ball. I did and I found a way to slump on that too. 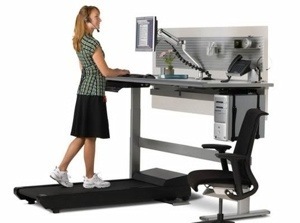 And if you want to go a steep further, don’t think there are not people working, at a desk, while on a treadmill. More articles on the dangers of sitting and the beauty of standing. 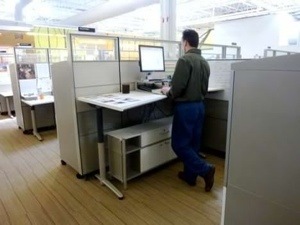 More photos of standing desk options, from the practical to the plain stupid. I am a social media manager living in Sydney, Australia. As well as my mild obsession with social media and live TV, I am into architecture, coffee and long walks in suburbia.